Heifer International Vice President for the Americas Program Oscar Castaneda recently traveled with CEO Pierre Ferrari to Haiti to celebrate the opening of a Heifer goat breeding center and see some of our work in the field. Below Oscar reflects on women in Haiti and their role in rural development. Where do Haitian Women Stand? In a country like Haiti, where life is undeniably hard (and was even before the 2010 earthquake), it comes as no surprise that the status of women is low. At the national level, only three of the 17 government ministers are women. Urbanization is taking place at an annual rate of 3.9 percent, and there is limited access to services and goods for women who live in the most marginalized urban and suburban areas, wehre basic institutions and/or state agencies are deficient or completely nonexistent. Gender-based violence rised dramatically following the earthquake (though legislation is in the works to elevate the rights of women in Haiti). We had just left the community of Degand and were heading toward Fort Royal in Petit Goave, where we teamed up with a local organization of irrigation system users. Heifer Haiti has worked with more than 150 families in this community and provided gifts of dairy cows; forage production; seeds; irrigation; and training and technical assistance in community organizing, improved production and marketing. Members of the community waited in the afternoon for the visit from the Heifer delegation, which included Heifer CEO Pierre Ferrari, his wife Kim Ferrari, blogger Betty Londergan and a fundraising consultant. The visitors were also eager to meet the community members and witness a Passing on the Gift ceremony at sunset. We had come from hilly and bumpy terrain and were glad to be driving on flat land through a banana plantation. The good soil and abundance of water on this farm was an uncommon sight in Haiti, where water scarcity and hillside agricultural production is the norm. Suddenly the road turned into mud, and one of our vehicles became stuck. An additional delay before arriving in the community! Once we arrived in Fort Royal, our meeting included welcoming words, introductions, testimonials and words of appreciation for the collaboration when it was most needed. It was a typical community celebration in the field, and farewell best wishes were given at the end. The sun sank into the horizon, and we were ready to depart for our next destination. The final item on our agenda was the presentation of Margarette Doscar, the secretary of a women's group that unites 35 women in Fort Royal. She shared the common challenges faced by Haitian women: taking care of the family, keeping every member healthy, providing food every day, and collecting watera task that often requires three-hour walks. Having received a dairy cow has really had a profound impact on their lives. A mother proudly showed the uniform her son was wearing as a benefit from selling milk. Kim Ferrari wanted to speak to the women. It was already dark, nobody could see or recognize one another, but everybody was there. Under the light of a cell phone, Kim reminded the women how important their role is, that they are the backbone of each family, and that society relies completely on them. She said she also realized how hard it is for women to live in communities without services and how creatively they respond to their needs. She encouraged them: "never give up your hopes." One of Heifer's 12 Cornerstones for Just and Sustainable Developmentthe heart of our approach to developmentis Gender and Family Focus. Although Heifer's contributions aim to support the whole family, there is a special effort to challenge the roles assigned in society to men and women and to create different conditions so women can participate in decision making, benefit from ownership of the Heifer animals and benefit from a range of trainings. 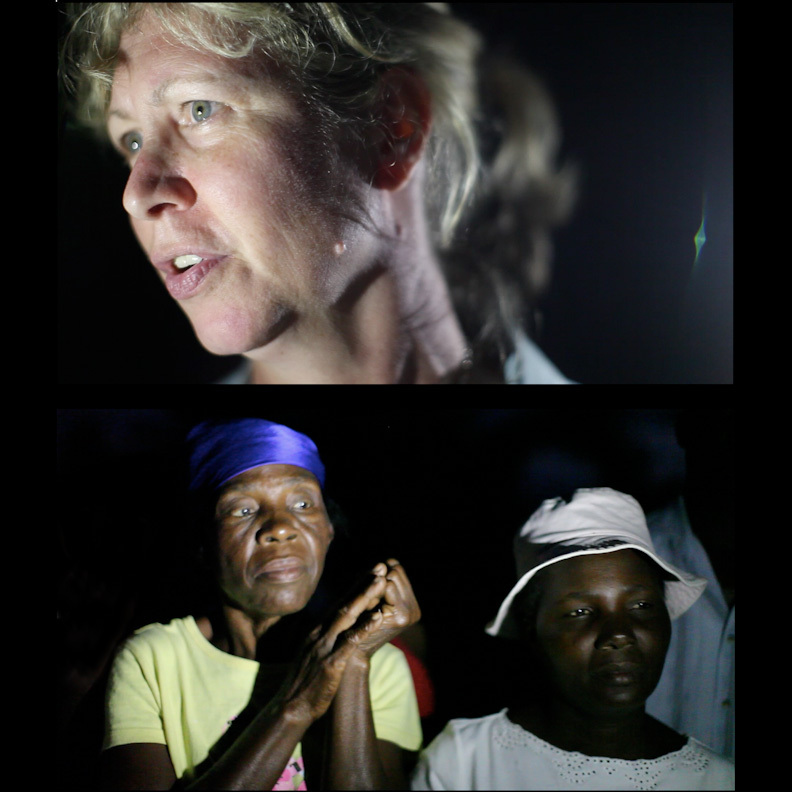 In the different groups we visited during this trip to Haiti, we found many women serving in leadership roles. In Tet Kole, for example, the general coordination in the Peasant Movement of Papay is managed by women. This is great, but far from enough. Women need access to additional leadership positions and have more and better access to productive assets. Heifer's Rural Entrepreneurs for Agricultural Cooperation in Haiti Project includes in its plan that a minimum of one-third of the breeding centers will be owned and managed by women. This is a key step in the right direction for in a country where getting ahead is hard enough, and even harder for women.